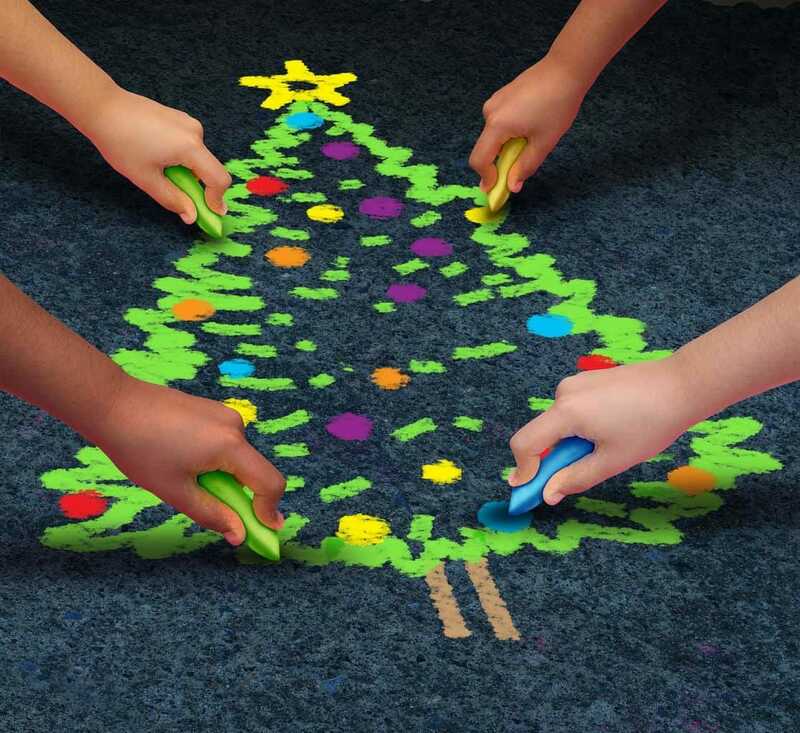 Hands-on Christmas games for preschoolers through 2nd grade. “Ring the Bell” Game- Using a large (4-foot x 3 foot) piece of heavy duty cardboard, I cut a large bell shape from the center.I then added ribbons with jingle bells attached to hang from the open middle area. The children threw bean bags through the bell to “Ring the Bell”. Great for hand-eye coordination and throwing skills! I use this with my 3 and 4 year old Special Education students. Find as many small/manipulative toys as there are the number of students in your class and the same number of hula hoops. I tell the students that Santa left me some toys to try out to see if children like them. I put one toy in each hula hoop and have a child go to a hula hoop and play with that particular toy. After 3-5 minutes they switch to another hoop, and so on, until the class is over. The kids really keep busy and seem to enjoy this activity. Make up a bingo sheet on large white paper with a picture in each square representing different Christmas items (such as: tree, stockings, fireplace and ornaments). Then call out different pictures or hold them up and the children have the match the picture they see to the paper they have. Little prices can be given when BINGO is achieved. During a Christmas circle time I asked the children to pretend to be different size Christmas trees. With hands together pointing high above their heads, they are big Christmas trees. Bending at the knees and slightly stooping, they are medium sized trees. Squatting down to the floor, they are little Christmas trees. I varied the speed and order as I called out the different sizes. Pass the tootsies (Tootsie Rolls) Have the children sit in a circle formation. First explain to the group that we are going to be passing 2 tootsie roll around the circle and please know stopping. Practice first without the candy. Now pick one child to start passing the 2 tootsies and play some fun Christmas music. Now stop the music and whoever is holding the candy should find a friend to give one to and say Merry Christmas and he/she gets to eat one to. Now get 2 more tootsies and start the game again until everyone has had a turn. Teaches patience , friendship , and sharing and of course fun. We played a little twist on duck duck goose…Santa, Santa, Reindeer. The children sit in a circle and the person who is “it” walks around the outside of the circle and touches the heads/shoulders of the children in the circle, saying “Santa” watch time they touch a child. When the person who is “it” gets to the child they wish to choose they say “reindeer” instead of Santa and that is their cue to chase the person who is “it” around the circle to the empty spot. Continue the game until all of the children have had a turn. We don’t do anything if the child gets “caught” by the reindeer to prevent tears and the win/lose situation. The children loved this and quickly caught on. Here is a great idea for outside play! Turn a simple game of “red light green light” into a chase to get to Santa! I had Elf hats for each child to wear and I wore a Santa hat as I said red light or green light. The kids will love racing to get to Santa (me) first! To make everyone feel like a winner at the end of the game, give the kids a prize! I gave out a little chocolate Santa, but anything will do! Have fun!! We play a fun game with jingle bells in the weeks before Christmas. I take bells and attach them to a little piece of elastic string, anything will do. I then lay out a flat bed sheet and have them put their bells in the center of the sheet. We then pick up the sheet with everyone holding on and working together. We sing Jingle Bells as we gently roll the bells around. On the second “hey” at the end of the song we lift high and the bells go sailing (sometimes to a low ceiling). They love this and ask for it daily. Take inexpensive Christmas bows and spread them around your classroom during center time or large motor time. Instruct the children not to step on the bows. Great for eye-foot coordination.